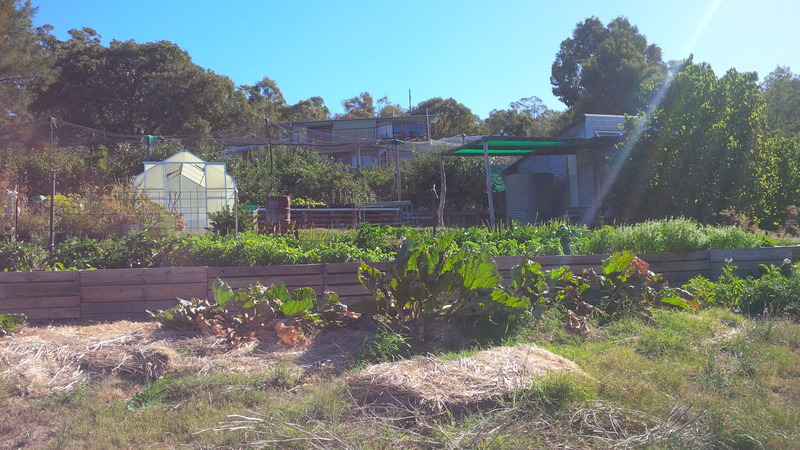 Last week we visited the Commonground co-operative, an international social change community that has several gardens, orchards, and even some unconventional homes like those I’ve been researching. The reason for our visit was because we thought it might be a good community to get involved with so as to better learn about sustainable living. The reason for this post is because much to my surprise they had a couple of unconventional homes, one actively lived in going on 11 years and the other currently being constructed. I thought this would be a good follow-up to my Earthships Post since until now I haven’t actually seen a house like this in person (apart from the straw bale hut at SNE of course). I came away from our afternoon visit to Commonground with two key takeaways for the house and garden – along with a whole box full of organic fruit and vegetables of course! 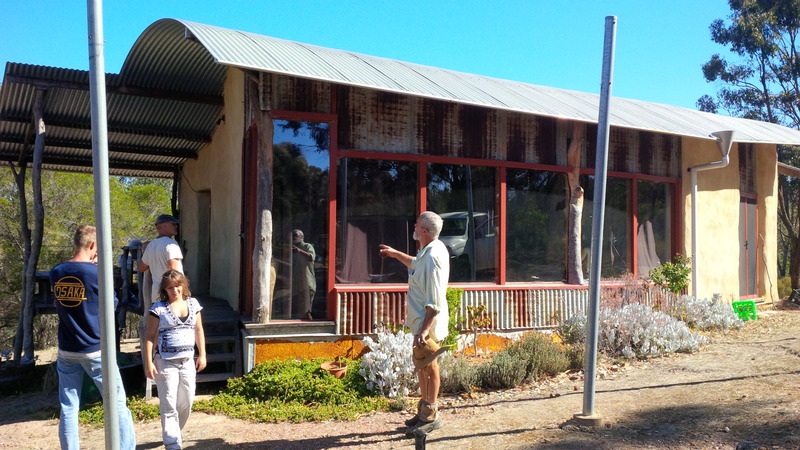 This straw bale home was built by hand incorporating using straw bale walls covered in Earth rendered plaster. It uses some of the same heating and cooling principles of the Earthships but is distinct in its materials used and above-ground construction. Instead of using rammed Earth like the Earthships, this home makes use of straw bale hay encased in Earth rendered plaster in order to achieve thermal mass surrounding three sides of the house. The concept is the same as using rammed Earth or concrete: the denser the material, the better it insulates, and straw bale works really well for this. In addition to providing insulation, the straw bales also serve as the house’s main structural components. Finally, the plaster applied over the bales protects it against moisture damage. One wall faces north towards the equator and has many windows, which allow heat in for passive solar heating during the colder months. 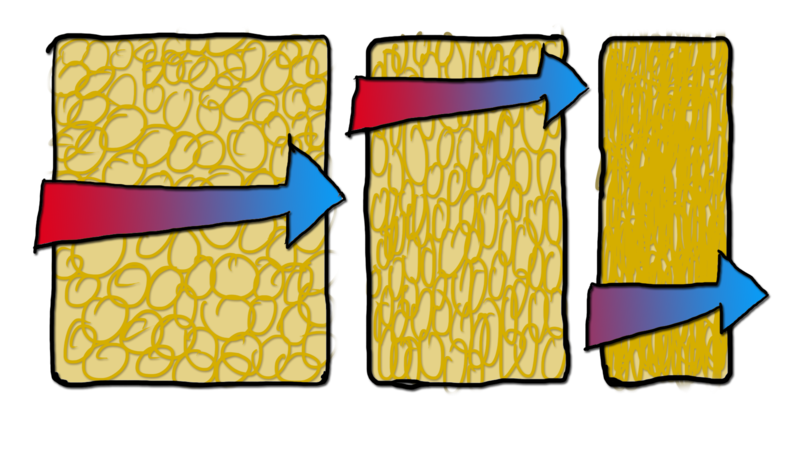 The thermal mass of the other three walls absorbs this heat and re-releases it during the evening. The interior floor is painted concrete to increase the heat-absorbing powers of the house interior. They also have a small wood burning stove for extra warmth during the winter. As with many off-grid construction, the roof is made of metal and shaped in such a way to maximize rainwater harvesting. A large tank is on the backside of the house and is pumped into the house for use. Brian, who was showing us around the property, took us to a house he’s been slowly working on over the past five years. He recently had a major setback following a flood that came through and knocked over the back wall of the house, so he has re-started it with some improvements. As with my own vision for an off-grid home, this one will use a concrete wall surrounding the back three walls of the house. This achieves the same desired effect as the straw bale, except requires less thickness due to its increased density, and also does not have the vulnerability to moisture. In order to avoid the problem he encountered with the recent flood, he has opted to make the back of the house curved and has created a very deep channel of bricks for maximum drainage before reaching the house wall. Underneath the bricks is a layer of plastic that is protected from tearing by a layer of carpet. The result is a water-tight channel that will cause water to flow harmlessly around the back of the house and towards a system of pipes that will collect the water and allow it to be put to better use. Once the house’s structure is complete, he will bring dirt up and over the back of the house to make it Earth bermed. The picture at right is completely random and just there to illustrate the point of what an Earth bermed house is. Not only does the Earth berm help insulate the home, but it also helps protect it from most natural disasters and also, in this particular case, allows this house to be in close proximity to the straw bale home while maintaining complete privacy. Since the Earth bermed home will be downhill from the straw bale home, neither house will be able to even see the other home without actually walking over to it. This is actually one of the greatest side-benefits of Earth bermed homes built on sloping land. 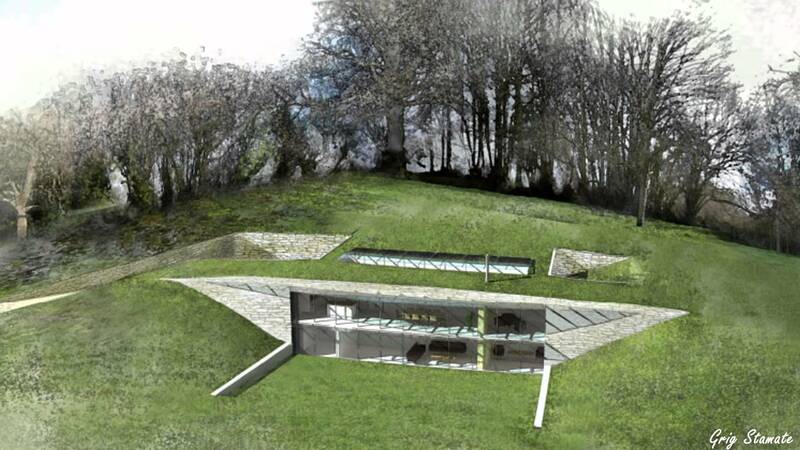 The biggest take away for me on this trip was the drainage channel along the backside of the Earth bermed house. Assuming our future home is on a sloping piece of land, which I hope it will be, I feel like this is a great way to both protect the house as well as funnel runoff from the land and put it to useful purposes, such as an irrigation system throughout the garden and orchard. Brian also gave us an extensive tour of his gardens. One thing I made a mental note of to reproduce was his system of composting kitchen scraps. 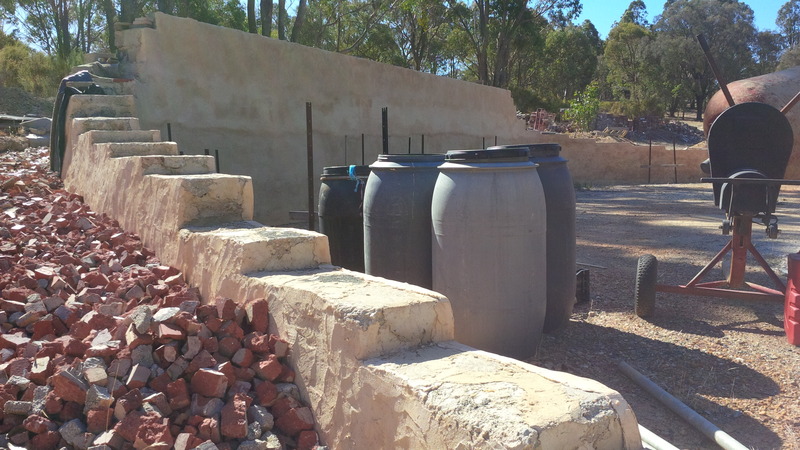 Rather than just making a big pile of compost, as many do, he puts them into 1 square meter plastic tubs that has a drain at the base. This gives him the ability to collect nutrient-rich runoff, which he then dilutes into water that feeds the gardens.